We had a hoiday in the Bridgnorth area in July 2002. One of the local attractions - for rail enthusiasts anyway - is the Severn Valley Railway. At the Southern end, on Kidderminster station, is the Kidderminster Railway Museum - formed originally by volunteers from the SVR, but now a separate entity. 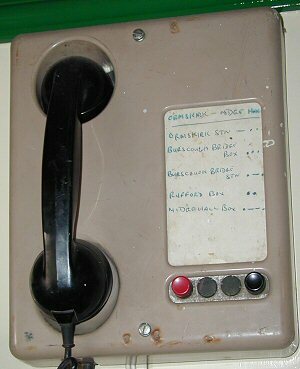 Here are some pictures of the telephones in their collection, which are all nicely displayed with informative captions. Again, almost identical to the Ericsson advert - just missing the watch receiver at the side. Notice the RH button is labelled 'Use this key to call Control'. Many omnibus telephone circuits were connected to the traffic control centre. To avoid bothering the controllers with routine matters, their code was a different battery signal from the other waystations. Hence the special button. 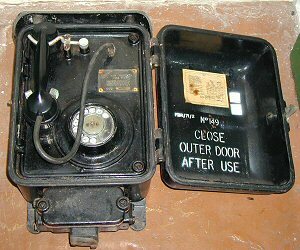 Associated with the omnibus telephone was the Code Ringing Sheet. Each waystation on the circuit had its own ringing code as you can see. 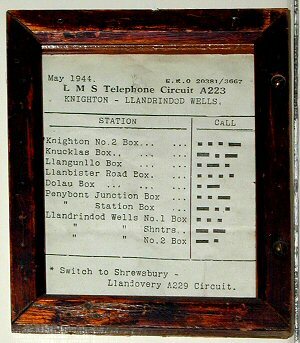 Here is the sheet for LMS Telephone Circuit A223, Knighton to Llandrindod Wells. The museum has a display of many of these sheets. Before we leave battery ringing telephones, here's a comparative latecomer. 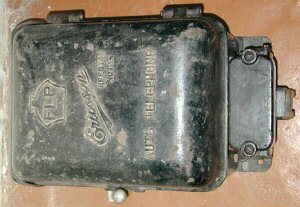 The battery ringing principle is retained but the case is made of plastic - probably ABS like the 700 series of telephones. The handset is the BPO No3 pattern. There's even space to stick the code sheet on the lid. This one reads 'Ormskirk to Midge Hall'. 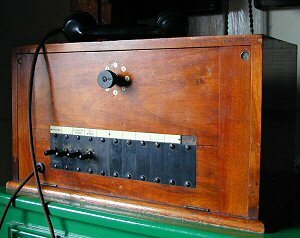 The internal wiring allowed for a multiplicity of different calling arrangements and up to four buttons. I guess it dates from the 1960s. They were certainly in widespread use around the railway when I started work in the early 1970s. A circuit diagram is included in the collection of paster labels. The selector switch has eight positions and I'm told was a GWR speciality. In the same vein as the phone above, it allows a variety of calling conditions to be applied. The user would select the correct setting on the selector and then press the ringing key below. Mike Tyrrell has written an article about the system - The GWR Selective telephone System. A rather massive piece of carpentry for the content, but beautifully made. The three labels are engraved 'NEWTOWN', 'OSWESTRY/ W'POOL', and 'SY/ W'POOL' Again there is an 8-way selector switch. I found this exhibit hiding under the shelves, so I dragged it out into the light to be photographed. Once it's open you can see that it's a pretty well-preserved Telephone No 149, flameproof telephone. I don't think these were widely used on the railway - too expensive - but they were definitely weatherproof. In fact virtually bomb-proof. They were used prinicpally in mines and at oil refineries where there was an explosive atmosphere which might go bang from the tiny sparks inside a normal telephone. Outside and onto the Severn Valley Railway itself. Here's a more typical period telephone installation. 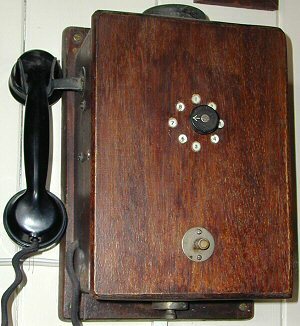 A desk telephone would reside inside the wooden box and above a loud-sounding bell, Bell No 67, is attached to make the ringing audible at a distance. You've only seen my narrow interest in telephones represented here. 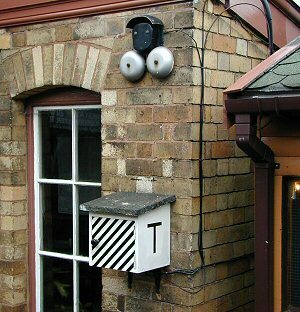 However the Kidderminster Railway Museum has a vast range of railway artefacts - from pen nibs to clocks, from signs to signalling equipment, from photographs to timetables and rolling stock. Well worth a visit. See their web site www.krm.org.uk/ for details.